I’m not a fan of talking about problems. I’m a fan of talking about solutions. That’s not to say I never talk about my problems. I do. And most of the time I am talking about problems for which I don’t have a ready solution or when there is no easy solution. In other words, I talk about problems in which the solution will hurt or disappoint someone. Which is why my smile is very, very broad when the problem solves itself. 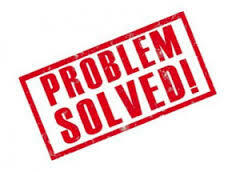 Day 308: When a Difficult Problem is Solved. Posted on May 10, 2014, in My life, perspective and tagged 365 reasons to smile, life, life lessons, musings, perspective, problems, Thoughts. Bookmark the permalink. Leave a comment.